iZettle makes it easier for UK small businesses to accept card payments via both its app and affordable card reader to create a full mobile point of sale (mPOS) solution. The following iZettle review is aimed to help you figure out if they are the right payment option for you. Exclusive Discount Offer: Click here to get an iZettle Card Reader for only £25 + VAT! The iZettle card readers are similar to you standard PDQ machine that allows both contactless and chip and pin payments. However, unlike many other card machines, you can use an iZettle reader without a merchant account. Accepts chip & pin, contactless, and magstripe payments – including Apple Pay and Samsung Pay. Contactless card payments are up to 25% faster than other mobile credit card readers on the market. Fast, stable and easy to use. Transactions made by contactless cards and below £30 are approved within seconds. Previous models included the Card Reader Lite (Connects via cable to the audio jack on your smartphone or tablet) and the Card Reader Pro (connects via bluetooth) and Card Reader Pro Contactless. Tamperproof design that self-destructs if someone tries to mess with it and also adheres to PCI PTS 4.1. Transaction protection that covers up to €250 in eligible chargebacks per month. All credit card data is encrypted according to the strictest standards. 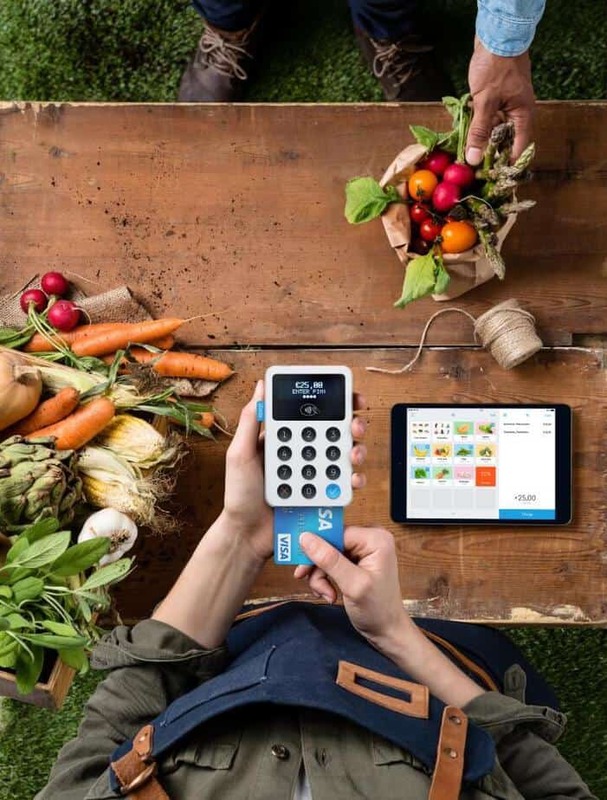 iZettle Reader Feature Score: 5/5, the iZettle reader has all the features small businesses need to accept card payments. For more information on supported devices see their Tested smartphones and tablets page. The iZettle reader makes it easy to start taking card payments and its charges are among the lowest in the industry. Although, not always lower compared to many UK merchant account fees. Cost of iZettle Reader: Currently £19 + VAT (Normally £59 + VAT), one-time cost per machine. Exclusively via this link! While the setup fees for getting started with iZettle are extremely competitive and among the lowest in the industry, transaction fees are likely to be by far your biggest cost with any payment processing solution. With that in mind how does iZettle stack up? iZettle fees are now a flat 1.75% per transaction. Previously, they had charged on a sliding scale from 2.75% to as low as 1%, although this was only for businesses that accepted more than £40,000 worth of payments though the reader per month. The good news is that they don’t charge for cash payments or card payments that are declined. They also don’t charge different rates based on the card type used including American Express. While this is good news if you process a lot of expensive cards such as AMEX and/or overseas credit cards, it’s not necessarily a good thing. The is because regular merchant accounts charge substantially different rates between credit card and debit card transactions. This is due to the risk associated with the different types transactions. Credit card transaction fees are typically around 2% per order, but a debit card transaction may be charged as little as 0.75%. Therefore, if you’re processing large volumes of debit card transactions, you could end up paying more than you would with a merchant account. Ongoing Cost Score: 5/5 – No monthly or setup costs make this a very cheap way to start taking card payments. Transaction Fee Score: 4/5 – iZettle fees are lower than most of their competitors, but are still substantially higher than for merchant account, especially for debit card transactions. 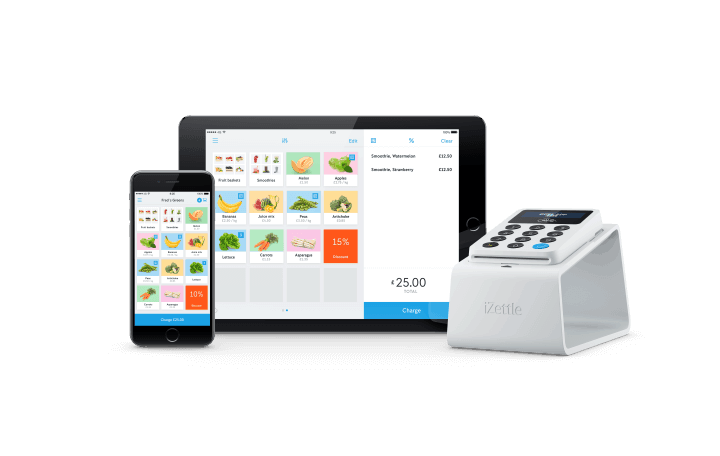 iZettle offers both Android and iOS versions of their app for both mobile phones and tablets. Android users can download the App from Google Play and those with iPhones and iPads can download the app from the Apple App Store. Please note at the time of writing no windows, PC or desktop apps were currently available, but they do offer a web interface. While you can use the app for free without the card reader, you will not be able to process payments without it. Conversely, you won’t be able to use the iZettle reader without a version of the app installed. Xero: Offers small business accounting software. iZettle allows you to connect your Xero and iZettle accounts to let you import your sales and payments data. Stands & Docks: Stands and holders available for iPad models 2,3,4 and Air to keep your iPad safe. Docks and cradles available for the iZettle reader that keep it charged. Prices start from £39 (ex VAT). Or Click here to buy with a reader for just £45 total. Receipt Printers: Can print receipts, order tickets, and reports. Some models connect wireless via Bluetooth. Prices start from £189 (ex. VAT). See: Star TSP143LAN Ethernet Printer and Star TSP654IIBI Bluetooth Printer. Barcode Scanners: Currently only works with iOS app and connects via Bluetooth. Prices start from £229 (ex VAT). This bundle was designed for London Black Cabs and other taxi services in the UK. It includes: iZettle Card Reader Pro Contactless, a wireless and battery driven receipt printer, mounts for the card reader and receipt printer, 20 receipt rolls and a power converter to keep your system charged while driving. 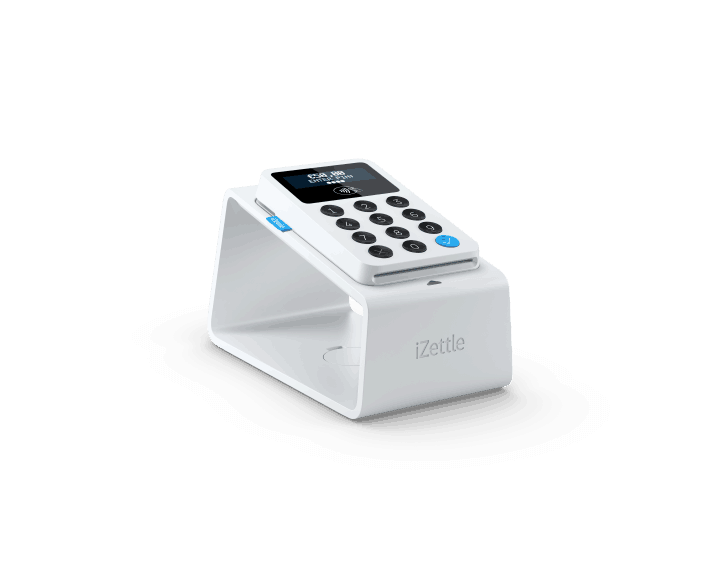 Finally, iZettle have bought intelligentpos to create iZettle Pro which allows them to offer bigger retail or hospitality businesses a sophisticated, full-featured EPOS system that goes above and beyond the solutions above. Additional features include: Stock management and inventory control for retail businesses, Table management and tabs for pubs, restaurants and bars and loyalty schemes for all types of businesses. Accessories Score: 4/5 – While all the accessories are cool and stylish, there is a relatively limited range of options and the prices for some are higher than equivalent accessories you’d find with a regular EPOS system. Did you know you can send invoices via the iZettle App or via their online dashboard. They then track and send automatic reminders until the invoice gets paid. Using the invoice feature is free as part of the app. However, any payment received will be subject to a 2.5% payment processing fee. There is maximum value of £5,000 per invoice. Every invoice sent will include a unique payment link. Your customer then just clicks the link and enters their payment details on the form. You will be paid the next business day. Reminders are sent 5 days after the due date if it has still not been paid. This is iZettle’s solution for using your card reader to charge people who are not physically in front of you. All you have to do is use the app to crate a payment link which you can share via SMS, E-mail or social media. Perfect for phone and online orders. The fee for payment links is slightly higher at 2.5% compared to the in-person fee of 1.75%. The reason is that there is a slightly higher fraud risk with this payment method. Therefore, there is also a £1,000 transaction limit per link. Once the user clicks on your link they will be directed to a payment form on their phone or computer. They then just have to enter their payment details and iZettle will handle the rest. You will then be send a e-mail letting you know it’s been paid. Payment links and invoice links are quite similar but have slightly different use cases. Payment links have a lower limit and less customer information and are intended for product sales to consumers. 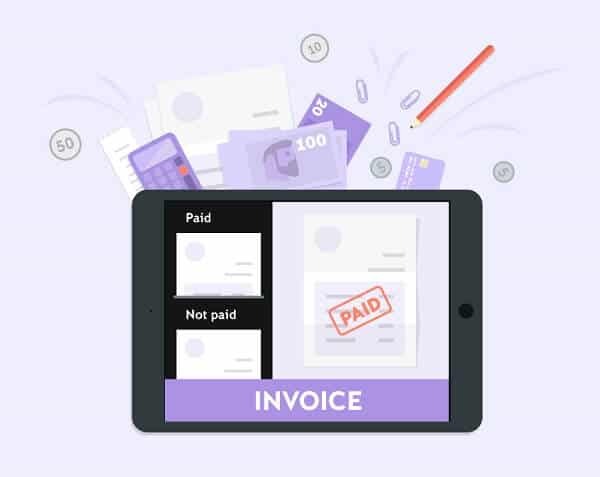 Invoice links include customer information, have a higher transaction limit and have the ability to send reminders and are intended to be sent primarily to businesses. Another difference is that an invoice is counted as a sale as soon as it’s been issued whereas a payment link does not count as a sale until it’s been paid. Does iZettle offer discounts and/or voucher codes? Yes, click here to get a card reader for just £25 + VAT (reg. £59 + VAT). What types of accounts does iZettle offer? They offer both business and private accounts. Sole Traders and registered UK business should sign-up with a business account. Does iZsettle work when not connected to the internet? No, they currently do not offer an offline mode due to card security issues. Can I use iZettle to accept online payments for my eCommerce business? Yes, you now can use it for your Ecommerce business by singing up with their iZettle Go PLUS plan. Additionally, iZettle can be integrated with Ecwid eCommerce shopping cart software. Can I use iZettle to accept card payments over the phone? No, (see above) to accept payments by phone you’ll need a virtual terminal. Does iZettle work with any third-party EPOS systems? Yes, iZettle recently purchased intelligentpos and is also compatible with Lightspeed EPOS. How long does it take for iZettle to deposit money in my bank account? While the exact amount of time varies, you can usually get your money within 2-3 banking days for daily deposits. You can also choose to have your money deposited weekly or monthly. For chip & pin transactions a maximum of £1,000 can be deposited per day for personal accounts and £500,000 for business accounts. Are there other transaction limits I should be aware of? The minimum amount for a single transaction is £1 for both private accounts and business accounts. Chip-card & PIN (incl. contactless) & Touch ID transactions have the following limits: Private account £1,000 per 24 hours and/or per card and transaction and cannot exceed £4,000 per 12 months; Business account £500,000 per 24 hours, and £5,000 per card and transaction. Other transaction types (Chip-card & Signature / Magstripe card & Signature ) have lower limits, but are very rare in the UK. Can I select the correct VAT rate for each of my products? Yes you can change this in your product library using either the app of web interface. Are there case studies of UK small businesses using iZettle effectively? Yes, iZettle has many case study stories on their website. It includes Big Issue, Peppermint Events, O-Food, London Bike Kitchen, Summer Hostels, Mr Wolfe Café and many more. Does iZettle offer business loans and/or merchant cash advances? Yes, if you’ve built up a good sales history with them, you may be able to borrow money via iZettle Advance. You can learn more about merchant cash advance here. To learn more visit: iZettle’s website here. 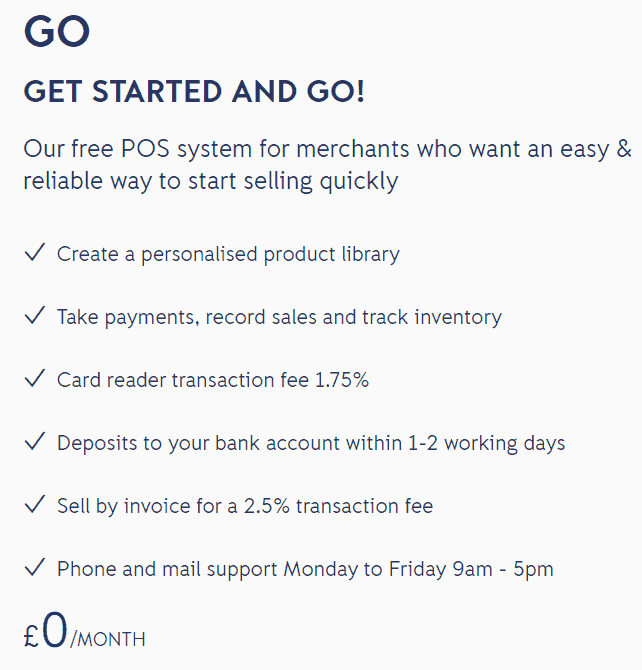 Please note: Merchant Machine has an affiliate agreement with iZettle that pays us a commission if you buy a card reader via any of the links on this page. We still think they’re great, but we thought you should know.